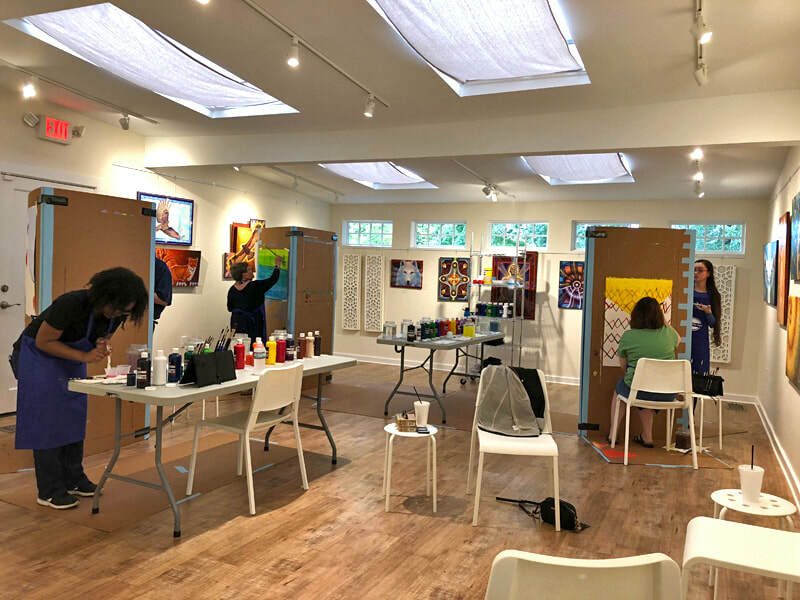 Art Body Soul opens the studio on Friday afternoons for two hour corporate/group events. Group Size Limited to 10. Minimum: 6 people. $20/person plus $8/person for materials. Contact us for more information or to book an experience. At Art•Body•Soul we combine the experience of our journeys, our meditative practice and a passion for the arts to create the Painting Out Loud Experience. In this afternoon workshop we use an intuitive method of painting often referred to as process art. Painting for process, rather than product, is a mindfulness and self-discovery tool. Mindfulness and meditation can be effective tools for stress reduction, increased awareness, emotional intelligence, improved decision making, focus and productivity. Painting makes for a rewarding meditative practice and provides an exceptional opportunity to inhabit the present moment. Through listening to your intuition in selecting color, shape, brush placement and images, ​you will have the opportunity to tap into your creative energy. We think that you will love to paint–love the brilliance of the colors and the feel of paint being pushed around the canvas. The meeting with yourself that occurs in the painting process is often surprising and insightful. Painting unencumbered by judgement is very freeing and creates amazing results. No previous painting experience required. All materials provided.